I have this love hate relationship with espadrilles. I always loved them because they stand for summer. Whenever they show up you know summer's around the corner. Summer. Sun. The beach. No stress. I also love them because of their simplicity. A shoe can't get any simpler (nor cheaper) than that, can it? A sole and two pieces of fabric joined together. However, I didn't wear espadrilles for the longest time because of the squeaky sound the rope of my last pair made. Just thinking of it gives me the shivers! So, what made me buy another pair and devote a whole post to them? To be honest I have no idea - I must admit I fell for the gray stitches on the sides, but was that enough to buy them, bearing the squeaky sound of the rope in mind? I guess I just needed another challenge: the espadrille make-over. Anyway, let's just start with this handful of ideas. Ready? 1. Cut a strip from the old T-shirt, about 3-4cm wide and 20cm long. 2. Fold over the strip so the fabric overlaps. With needle and thread, in the middle, gather and secure the fabric. Cut of excess fabric, if any. 3. Fold a small piece of fabric over the stitches, to hide, and secure with a few stitches on the back. Shape the bow tie. 4. 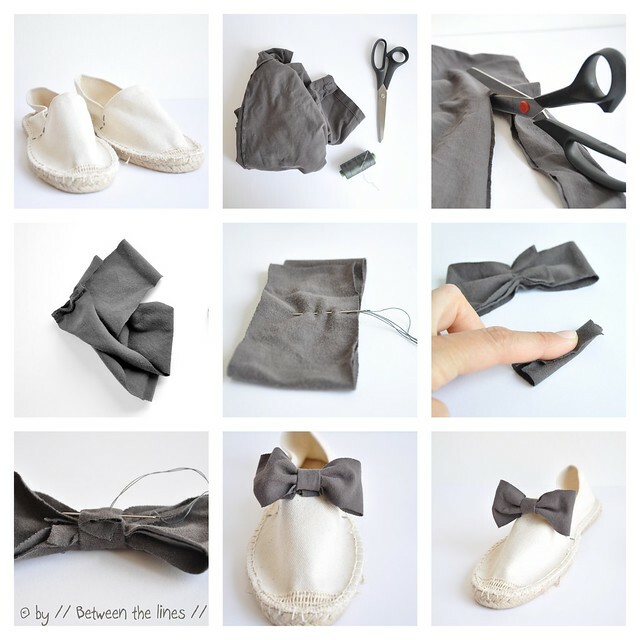 Position the bow-tie onto the espadrille and secure with a couple of stitches. 5. Repeat for the other shoe. Wear! 1. Cut a strip of t-shirt. 2. 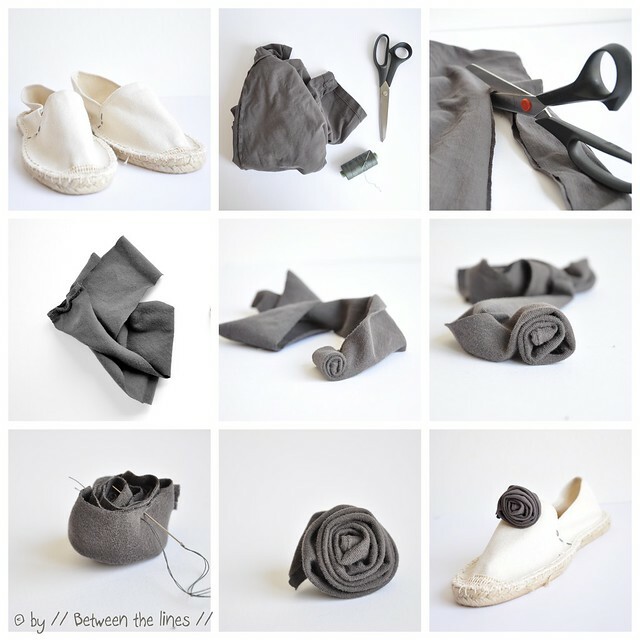 Fold in half and start rolling the fabric to form a rose. 3. Secure at the bottom of the flower with a couple of stitches. Shape. 4. Position onto the shoe. Sew into place with a couple of stitches. Note: the size of the flower depends on the width and length of the fabric. You can play around with both. Or why not make several flowers different in size and color to form a rose garden on your shoe! 1. Cut three (or more) not so round circles of roughly the same size. 2. Fold them in half and again in half and place all three on top of each other. Pin together. 3. Next, sew them together with a couple of stitches and shape the flower as you go. 4. Place on top of your shoe. Sew into place with a couple of stitches. Note: Same thing applies here: play with size and color or combine several to form a flower patch on your shoe. Add sequins, beads, leaves, ... if you wish so, or just keep it simple. This is a fairly easy craft, which kids could easily do. It's not very time consuming, no special supplies are required and the reward is immediate. Maybe a fun craft idea for a summer birthday party!? If you can't find espadrilles right away, gym shoes might work just as well, just as any other ballerina or pair of flats. My espadrilles have been extensively tested by now. And you know what? This pair doesn't squeak!